I have noted that this particular posting about our Filipino traits and values has been/is very popular among visitors and I guess the popularity stems from the desire of seriously concerned fellow native Filipinos to: learn, have deeper understanding, find solutions to stop and reverse the national predicaments suffered and being inflicted on the lives of past, present and foreseeable future generations of our fellow native Filipino majority. With such understanding, it is hoped that it will lead to an appreciation and realization that a great part of the problem is ourselves. I think and believe that many of our national problems are created and/or heightened, knowingly or unknowingly, by our so-called Filipino Norm of Morality. Although we may explain our behavior by referring to traits or values, to those of us who have some exposure in psychology we may define traits as more about dispositions or tendencies; while values as generally what we consider important and thus prioritize and use as standard for behavior or justification/rationalization for actions or choices. We appreciate and realize that traits and values may influence one another reciprocally, but I believe and think that the latter have greater influence in more instances (a thinking person tend to behave more consistently according to his values). to express in terms of national unity, i.e. 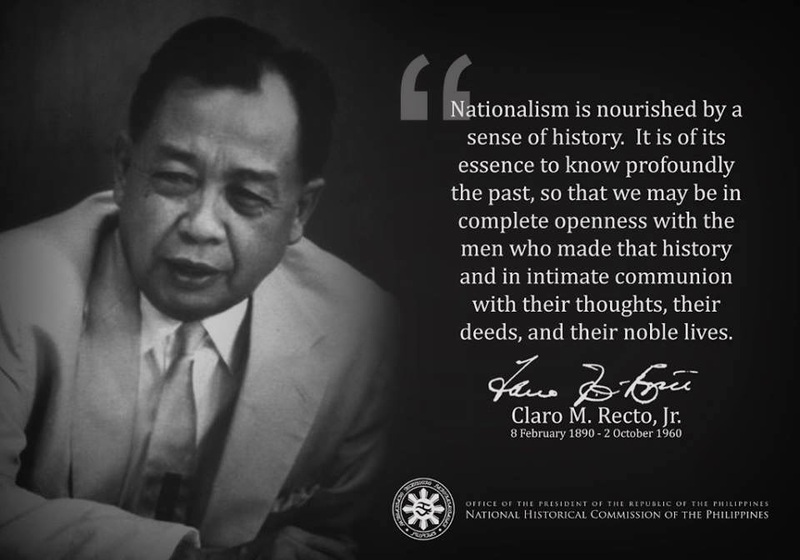 Filipino nationalism; the sine qua non for national progress, that is, the attainment of the common good. This post actually touches the issue of culture, i.e. our native Filipino culture. As we know, it is imperative that we obtain a deep awareness of our native history and society/culture; our society which embed in the subconscious Filipino mind within each of us --through our home, church and school, etc.-- a culture, our native society's worldview: the source of our values, attitudes and behaviors- which has been formed by a complex mix of geography, still primitive/traditional economic relations, religion, and long, divisive colonial history, etc. Here our native culture is looked at just from the religious point of view. Frankly, I see this point of view as limited or inadequate, based on what I have alluded to regarding source in the preceding paragraph. I will go back, try a broader and deeper look into the issue of our native Filipino culture, i.e. cultural aspects which I see as obstacles to national development sometime later. [ ADDENDUM: As I commented in Split-level Christianity, Part 2 of 2, below essay is similarly a synthesis of Christian/Catholic theology and social science; thus expectedly with a Christian spin. I add that I personally think and believe that (personal and social) ethics and morality do NOT necessarily emanate only out of having a religion or being a believer in a "God" (for us: the monotheistic Christian God as traditionally or Biblically understood or other). Contrary to the assumption or belief of many Christians, native or not, there are atheists, agnostics, so-called pagans, non-Christians and what have you who were/are more ethical/moral and unselfishly act for social justice than those who are self-proclaimed or supposedly religious Christians of various shades: Catholics, mainline Protestants, Pentecostals or Evangelicals. With the ever-worsening greed and corruption that gravely permeate all branches of our civil government and military, including the public/social service institutions (see all these crimes and treasonous acts as essentially glossed-over legacies of the Marcos Dictatorship); and with the majority of our fellow Filipinos kept functionally ignorant by design, the latter can only feel perennially abandoned by its government. and thanks to the imposed ignorance of the native majority (as transparency can be put in place only by strong demand from a well-informed and active majority). We oftentimes wonder what kind of values we have now; what have we lost in terms of social conscience, of social morality (let us forget here about sexual morality to which the church hierarchy seems to pay relatively more attention to). The question nowadays seems to be "Why can't we be good?" We Filipinos point out, ad nauseam, about our homeland as being the only Christian nation in Asia, as if it were a badge that we can brandish around. We do not seem to wonder whether that really is something to be proud of; or are we just -unknowingly- exposing our ignorance about what authentic Christianity is all about? What kind of Christian education did these members and/or children of the elite class get? How come some, if not many, of those who commit crimes and are guilty of corruption were from exclusive Catholic schools? What kind of scholastic mentors/teachers did they have? Have the mentors themselves sold out? Why did the good moral and church social teachings not stick? We have expected these alumni of Catholic schools/colleges/universities to be better than those who attended public or secular schools. Is it our unique case that social morality can not really be taught in schools nor be practiced in the real world? Below is an interesting and informative essay on understanding our Filipino value system, written just a few years after the Marcos downfall, by the late Fr. Vitaliano Gorospe, S.J. (However, I think Fr. Gorospe was quite naive about the kind of leadership our homeland needs then and now). CHAPTER VI: UNDERSTANDING THE FILIPINO VALUE SYSTEM - FR. VITALIANO R. GOROSPE, S.J. Since the February 1986 Revolution(1), values development has been one major concern of the Department of Education, Culture and Sports (DECS). Undersecretary Minda Sutaria has publicized the second draft of the DECS Overall Values Framework, designed to assist teachers at all levels. This latest draft, basically similar to that proposed by Fr. Raul Bonoan, S.J. in "Paideia, Humanism, and Magpakatao: Values for National Reconstruction,"(2) bases its framework on the provisions of the Philippine Constitution of 1986. If we are to discover our traditional values and make sure that they contribute to the "just and humane society" and "total human liberation and development" of which the Philippine Constitution speaks, we must ask some basic questions. 1) What is the philosophical basis of Filipino values? 2) What is distinctive about the Filipino value system? A brief introduction to the philosophy of human values is necessary for an understanding of Filipino values and values education. A Filipino experiences family closeness and solidarity (pagpapahalaga sa pamilya), politeness (use of po or ho), hospitality (tuloy po kayo), gratitude (utang na loob) from "within", that is, subjectively and emotionally, unlike a non-Filipino observer, social scientist, or psychologist who studies Filipino values objectively from "without" or "from a distance". Such Filipino values as social acceptance, (pakikisama, amor propio, economic security, pagmamay-ari), and trust in God (paniniwala sa Diyos, bathala or Maykapal) find their philosophical basis in man's dynamic openness toward nature and the world (e.g., the value of hanap-buhay ng magsasaka), one's fellowmen (the values of paggalang, hiya, katarungan, pag-ibig), and God (the values of pananampalataya, pananalangin, kabanalan). This dynamic openness of man is an openness to the possibilities of the future. That is why values are something to be realized. Take the value of peace. The Philippine situation is now characterized by insurgency; conflict between the NPA, the MNLF and the AFP; vigilante groups; hostility and division--in short, an absence of national peace and order. Human values are not merely private. All values have a social aspect. The government official who demands porsiyento, the fireman or policeman who extorts tong or lagay for a service which is his duty, all contribute to the worsening graft and corruption. We are all responsible for one another (tayong lahat ay may pananagutan sa isa't-isa). Values are both subjective and objective. They involve a subject or person who values (e.g., a young girl) and an object or value to be realized (e.g., pagkamahinhin). Justice is objective because it is a value that should be realized by all. It also becomes subjective if justice becomes a value for me. There is an objective difference between value and disvalue, pleasure and pain, life and death, poverty and affluence, heroism and cowardice, truth and error, right and wrong, holiness and sinfulness. The difference is not only in the mind or a matter of personal taste or preference. Even if I close my eyes to the ugly poverty around me, the poor will not disappear. Values are not objective in the sense that they are found in some static heaven: they are relational and embodied in person-value-types (ideal moral persons). For example, to a tipong-mukhang kuarta [an avaricious look] profit is more important than service; to a tipong-politiko [political type], pera [money], propaganda, politika [politics] are more valuable than honesty; tipong siyentipiko [scientist type] or tipong-artista [actor type] personify agham [science] and sining [art]; tipong madasalin [pious type] may exemplify kabanalan (piety). Cory Aquino embodied all that we wanted our President to be--credible, honest, just, with a strong faith in God and in our people. The ideal type or Filipino model during the "parliament of the streets" was the tipong-maka-Diyos (religions), makatao (people-oriented), makabayan (nationalistic). The heroes of EDSA placed the good of the Filipino people before the safety and security of their families. They were willing to risk their lives for God and people. Value-ranking or the priority of values is not merely arbitrary or subjective. There is an objective ranking of values based on existence or reality and other objective criteria. Using the criteria of permanence, ability to be shared, and depth of satisfaction, Max Scheler ranked human values from the lowest to the highest as follows:(3) sense values like sensual pleasure are exemplified by the lakuatsero or pabling; utilitarian values like profit and efficiency by the businessman and technocrat; life values, by the doctor and the hero, e.g., Dr. Bobby de la Paz and Emilio Jacinto; cultural values, by the genius and the artist, e.g., Jose Rizal and Francisco Balagtas; religious values, by the saint, e.g., Mother Teresa or Lorenzo Ruiz. Moral and religious values are pre-eminent and claim the highest priority in the objective scale of values because they are absolutely necessary in order to become fully human (magpakatao). What are Filipino values? What is distinctly Filipino in our value system? The Filipino value system arises from our culture or way of life, our distinctive way of becoming human in this particular place and time. We speak of Filipino values in a fourfold sense. First, although mankind shares universal human values, it is obvious that certain values take on for us a distinctively Filipino flavor. The Greek ideal of moderation or meden agan, the Roman in medio stat virtus, the Confucian and Buddhist "doctrine of the Middle", find their Filipino equivalent in hindi labis, hindi kulang, katamtaman lamang. Secondly, when we speak of Filipino values, we do not mean that elements of these Filipino values are absent in the value systems of other peoples and cultures. All people eat, talk and sing, but they eat different foods, speak various languages and sing different songs. Thus, we easily recognize Filipino, American, Chinese, Japanese or any other foreign food, language or music. The difference lies in the way these elements are ranked, combined or emphasized so that they take on a distinctively Filipino slant or cast. For instance, in China, honesty and hard work may rank highest; Chinese and Japanese cultures give great value to politeness and beauty; American culture to promptness and efficiency; and Filipino culture to trust in God and family centeredness. In this sense of value-ranking and priority of values, we can speak of dominant Filipino values. A Filipino value or disvalue does not exist alone, in isolation or in a vacuum. Filipino values like bahala na, utang na loob, hiya, pakikisama, pakiusap are clustered around core values like social acceptance, economic security, social mobility, and are always found in a definite context or set of circumstances. Both positive values and negative disvalues together form a characteristic constellation in school (aralan at dasalan [studying and praying], kuwentuhan at laruan [story telling and game], inggitan at tsismisan [envying and gossiping]), which differs from the configuration found in government offices (pagkakaisa [unity] , pagkabayani [heroism], intriga [intrigue], palakasan [show of power], sipsipan [bribery], palusot), in business firms (palabra de honor [word of honor], delicadeza [finesse], "commission", "kickback", padulas [grease money], lagay [bribe]), or in the barrio barangays (paggalang [honoring], pagdadamayan [comforting], bayanihan [cooperation], bahala na [come what may], utang na loob [gratefulness], hiya[shame]/pakiusap[appear], palakasan [show of power]). To change a framework of values, it may be necessary to change the constellation and context of those negative values that hinder Filipino and Christian development. Fourthly, we can speak of Filipino values in the sense that the historical consciousness of values has evolved among our people. The Filipino concept of justice has evolved from inequality to equality, and to human dignity; from the tribe, to the family, and to the nation(6). Filipino consciousness of these different values varies at different periods of our history. It is only in the last two decades that the Filipino people have become more conscious of overpopulation and family planning, environmental pollution (Kawasaki sintering plant) and wildlife conservation (Calauit Island), and the violation of human rights (Martial Law), active non-violence and People Power (1986 non-violent Revolution). Are Filipino values good or bad? The truth is that Filipino values are ambivalent in the sense that they are a potential for good or evil, a help or hindrance to personal and national development, depending on how they are understood, practiced or lived. They can be used in a good or evil context, e.g., pakikisama sa kabuktutan or sa kaunlaran. Filipino values have both positive and negative aspects depending on the context in which they are found. In a social system or atmosphere of extreme insecurity, the positive qualities of the Filipino take on negative and ugly appearances. For example, utang na loob can lead to pakiusap, nepotism and "cronyism". Pagmamay-ari ng kapangyarihan (the possession of power) and their abuse could lead to class distinction or the "malakas-mahina system". Hiya can become pakitang tao or gaya-gaya; machismo (tunay na lalake) is partly responsible for the "querida system" and the doble kara morality. To show the ambivalence of Filipino values, one example will suffice. Take the well known but ambivalent Filipino bahala na mentality. On the one hand, this Filipino attitude could be the root of the positive value of risk taking, entrepreneurship, and social responsibility. Prof. Jose de Mesa, in a pioneer book on the Filipino and Christian meaning of bahala na, stresses the positive meaning of this virtue of risk- taking, enterprise and joint trust in both human effort (bahala tayong lahat) and divine Providence (bahala ang Maykapal)(7). A people's will to take chances and risks, no matter what difficulties and problems the future entails, is necessary for a nation's growth and destiny. Bahala na could be a genuine faith and trust in Divine Providence that also presupposes a self-reliance (pagsasarili) that took the form of People Power in the EDSA revolution. Bahala na was a positive and nationalistic virtue for Jose Rizal, who believed that Filipinos could no longer rely on the Spaniards, but only on themselves and on God. On the other hand, in the past the negative aspect of bahala na which dominated Filipino life meant a false sense of resignation (ganyan lang ang buhay), a superstitious belief or blind faith (malas/suwerte, tadhana, kapalaran), or escape from decision-making and social responsibility. As such it may be the root cause of national apathy (walang pakialam) and collective paralysis of action (bakit pa kikilos) to solve both local and national problems. Everything is already predetermined or fated. Negatively, bahala na could engender a false sense of security with God as insurance or a security blanket. For example, if God wants Filipino families to have plenty of children (anak ay kayamanan), God will take care of everything. 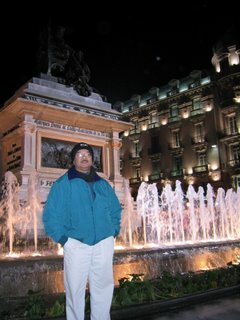 Bahala na could be the cause of the absence of national initiative and of that discipline required for national growth. When negative bahala na prevails, nothing ever gets done. Potholed roads, uncollected garbage, countless unsolved murders, carnaping and smuggling remain year after year. How many have ever been arrested, convicted or jailed for wanton murder or for notorious graft and corruption? A sense of national frustration, helplessness, and despair grips the nation and the people no longer care. Nothing is going to happen--Bahala na, come what may. From a Filipino perspective, what social reforms are necessary to transform bahala na positively? No society will long endure unless there is justice; that is, unless a system of reward and punishment exists and is effective. If in Philippine society lying and stealing people's money are rewarded and truthfulness and honesty are punished, what else can one expect but a badly broken political will for national reform? The present government should therefore prioritize an effective system of universal sanctions for those who hold power. From a Christian perspective, the Christian doctrines of divine Providence, creation, stewardship of land and property, and the conservation of our natural resources remain the challenge and task of parents, educators, and Christian evangelizers. Split-level Christianity or double-standard morality, the immorality and hypocrisy of many so-called Filipino Christians, is a scandal to both Christians and non-Christians alike. (8) It is important to distinguish between pseudo Christianity in all its varied forms and authentic Christianity; between bad and good Christians. We must also take into account the ambiguity of any religious commitment, which is not something made once and for all, but a life-long process which demands constant conversion and renewal. We must also distinguish between Filipino actual and normative behaviour (between what is and what ought to be). Filipino values are not static, i.e., they are not simply what they are, but dynamic, i.e., they become. From a historical perspective, the question to ask about Filipino values is: Ganito kami noon: paano kayo ngayon? How are we to know towards what goal or direction Filipino values ought to move or become? Now that we have regained our democratic form of government once again and have arrived at a privileged historical kairos, how do we transform Filipino values to build a more "just and humane society" (Preamble, 1987 Constitution)? We need both external structural and internal cultural change. It is here that the Christian faith should, in the last analysis, point the way to the kind of values education needed for national reconstruction. Please consider the aspect of our Filipino language/dialect as this relates to our values. Ours is an inadequate language that the commonly cited taglines/lingo almost always defies logic. Remember : language defines logic. What we hear, what we utter and say eventually form our value system.Our clueless educators especially those from UP ( who btw, are handsomely paid by the Filipino taxpayers) insist on the use of the Pilipino,a dead language which cannot lead to progressiveness. I do not know if you think I have expressed myself well enough for you to understand me but it is because I am a Filipino. I cannot express myself well. I do not want to use the popular buzzwords because these corrupt my mind. p.s. The Jesuit priest who wrote the subject article must have been away too long-naming Corazon a model of what we want in a Filipino leader. What Fr. Gorospe explained is appreciated but there is a deeper and more important reason why we Filipinos have values like this. We have to act and make a 360 degree turn in our lives for the better and I believe we can start it right by healing our generational sins. Am sorry IDNKY and I unfortunately have no time to find out. Anyway, looks like you made several assertions that need further elaborations. I do not know what made you claim that "language form our value system," or that Pilipino is a dead language or that it will not lead to progressiveness; or that UP professors are clueless and alluding to their being highly paid. You seem more to have some chips on your shoulder for whatever reason(s). How do you propose to heal our "generational sins?" And of course, we need to know and understand what these are that you refer to. Denial or "keeping under the rug" does not solve problems. Your comment reminds me of Imelda Marcos' instructions to put up tall fences and have them painted to cover the slum areas ("eyesores" to her and her sycophantic cliques)whenever she with a foreign dignitary has to pass by or to show around. Before a person can change oneself, he has to know himself; that is, if he wants to improve himself, he has to look at himself, know and understand his strengths and weaknesses, the latter he shall try his best to correct. Any seriously thinking person knows it is not a perfect world. Sure there is corruption in any country or society. It's all a matter of degrees. And ours is one of the worst, in that our rulers' acts of corruption gravely and adversely affect the lives of the present/future generations in the homeland. Maybe you are "lucky" not to be in dire straits due to the systemic corruption in our homeland. I know many friends and relatives who were in middle class and now have slid down to near misery. Thanks to what you seem to see only as only a "few" rascals (to put it mildly) --who in my mind, ought to be in the crosshairs of a firing squad. Note that the "few" since the Marcos times are still around and are active members of the ruling elite, and joined by the new breed of similar minds. is "ningas kugon" a part of our philippine value system..presently i'm taking this subject (philippine value system) and is about to report this saturday the asigned topic is "nignas kugon"..unfiortunately, i haven't found any related topics in my searches..i would be very glad if you could help me...thank you and keep up the good work! heck out my archives. go to the sidebar and click on "filipino values"; there are 10 articles listed under it." Click also SCRIBD in the SIDEBAR. wala akong makuhang essay para dito....////????? :must have some specified detaiLs on where does these values come from. We can safely think most foreigners in our homeland are there for their selfish individualism and business(i.e. multinationals/transnationals)reasons. Thus, it would be/is logical for them as individuals and their business goals to learn and understand Filipino values in order to employ such knowledge to manipulate the natives (the market), to consequently and endlessly expand and maximize their bottom line(profits - to be repatriated out of the country). Filipinos values are made for us to live to adjust situation it is just being influenced by different culture that makes the complex Filipino values, it is also compromise to the way of living, socially, economically and capitation for survival. some of the values we have is embarrassing..however, we are still using it..
Filipino thinks psychologically, intuitively and inductively. These notion seems an absurd avenue for us Filipinos to constitute a strong foundation to our daily living especially to our decision makings. We must be more reflective and also considerate to the situations that bother us. I am not pretty much sure if Filipino philosophy can be an apt ground. It is likewise a drift. From what i see, Filipinos nowadays only few of them still has the FILIPINO VALUES. It's very important to have this character because it's for our own good, we respect others and they will respect us back. We should instill Filipino Values not only to our future generations but also to the generations of today. I am a foreigner and it really goes beyond my comprehension why Filipinos still think and behave today, the same way we did 50, 60 years ago. With today's technology (internet) all information is out in the open. But instead I still face a lot of Filipinos who are naive and ignorant. The holistic view, the harmony model, hiya, utang na loob, respect (Mano) (to name just a view) will not lead to progress, nor evolvement of the population. Furthermore, although on paper there may be a strict seperation of state and church, in reality that seperation does not exist at all. In my country we have a complete different definition of the word respect. A person has to earn and deserve my respect based on perxsonal achievement. Being older and being a parent is NOT an achievement. This is why doing the Mano is almost impossible for me to do. Or I can do it but themn it means nothing to me. Hence the gesture is empty while the receiver will think I respect him/her. I also notice that Filipinas are treated unequally bec Filipinas are very submissive to their husbands/boyfriends and or males in general. Leadership provides with the opportunity to lead. Especially it is important for college students to enroll themselves in leadership programs, as it helps them to learn and lead during their college years. Students go thorough complete transformation by attending such programs. It develop many attributes to their personality like it helps them to gain confidence, development of communication skills, expansion of their network, getting management skills, development of problem solving skill, getting recognized, enhance resume and many more. Mr Chris Salamone formerly served as a faculty member at Loyola University Chicago School of Law and the National Institute of Trial Advocacy, and served as a leadership curriculum adviser at The University of Central Oklahoma. Chris Salamone http://goo.gl/XJ75Us works to improve the lives of young people around the world through his many philanthropic endeavors. To this end, he functions as chairman of the Lead America Foundation and extends a considerable amount of financial support to fund the education of 300 children in Haiti. I got your point. You know what? This post should be in local politics news. This is what they should cover.